Seeing Bird #1 finished, the underpainting for Bird #2 will make more sense to you. Yes, he's blue and gold and peach to start with. I wish I could leave the painting like this. It looks like Bird 1 is fighting his own ghost, or an angel. I like the way Bird 2 looks illuminated. The light I've envisioned is beginning to work now. 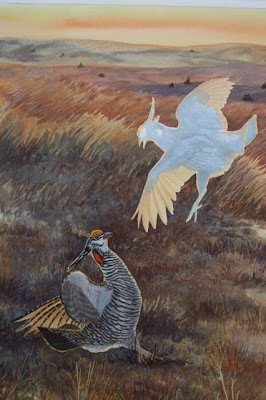 I started this day of painting thinking I'd have it all done by nightfall, but it's all I can do to get Bird 1 done and Bird 2 started. Wow. 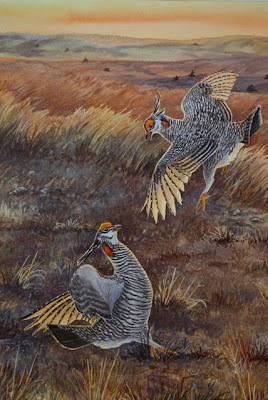 Thanks to all the markings on the birds, this would be a challenging enough painting even without special lighting effects. But I'm finding that I'm burning extra mental wood just trying to figure out how to light my subjects. It would be so easy if I were just copying a photo, but that's not how I work. I build the birds and then figure out a lighting regime that pleases me. Sometimes I have to make clay and cardboard models to see how the light would fall on them. Still cranking away on it. There are a few things I have to enhance, a few I have to fix, but after painting Bird 2 and diddling away at the grass some more, I'm done in. The work will go into another day. I like this bird. He's really lit up. I've had fun tracing the outline of his portly belly on the near wing, and letting the sun blast through his secondaries and primaries. Now it's time to diddle around in the grass a bit, darkening here, toning down there...trying to weave it all together with some well-placed lit grasstops. I decide to quit before it gets too fussy. I think it's going to make a good poster. They can put type right over the grass, it'll look fine if they drop it out to white or even yellow. And when I give a painting workshop at the festival, I can share with everyone how the show poster was done. That'll be cool. Just another way blogging for you sweetens my real life. Speaking of real life, come meet us and hear our music, willya? The Swinging Orangutangs are all het up. We've been rehearsing for our appearance at the Ohio Ornithological Society's Waterfowl Symposium this coming Friday, February 26, at Columbus Audubon's beautiful Grange Center. Whether you're a birder or not, if you're in the Columbus area you should come out and see us at this fundraiser for Nature Iraq. 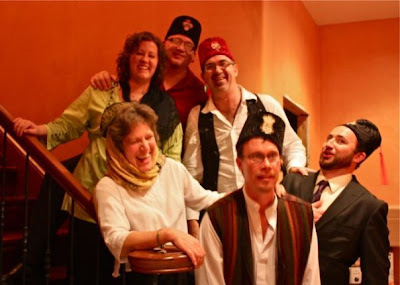 There will be fabulous Middle Eastern food, specialty beers, great people to hang out with, and live highly danceable eclectorock from Bill of the Birds, the Science Chimp, and the rest of the Orangs. Who will be in fezzes. 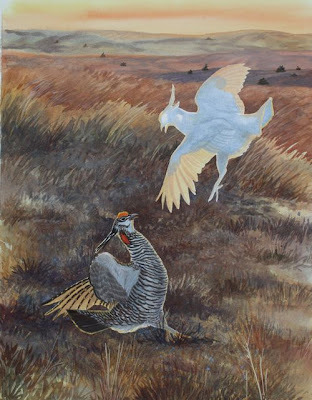 You can attend the Friday night musical fundraiser for only $10, or you can go for the whole weekend enchilada of field trips and talks about waterfowl. Ought to be a blast. You can register here. Who knows--maybe after you've partied with birders, you'll want to take in the whole weekend, maybe even get yourself a fez. They're very comfortable. Wow! I love the painting, nice work! uhhh, Fezzes... not so much. Can't wait to see it in flesh!!!! Can't wait to see it come to life against that prairie sky that I get to call home! Wow, Julie, I love your new web look. 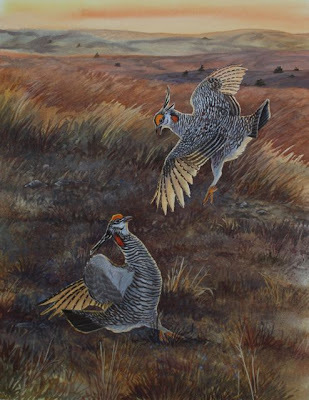 I just got back to catch up on your blog and the prairie chicken painting series is fascinating. I had no idea . . . and learned so much. Thanks! The reason for my time-out is the adoption of a new dog (came with name Luna Mae) and you and Chet had some influence in that decision. We had doggy kisses for Valentines. These posts have been a fascinating lesson for me into how a painter works and how much work and thought (not to mention skill) goes into the finished result. I'm really enjoying this! Thank you -- I'll visit here often. Just when you could get the kids back on the bus to school, it's time to pack out again! Have a great time away from the melting snowpack and mud, you have some fun coming to you! May the earth start to loosening up to the wrigglers by next week so that you're soon greeted by peenting on the other side of your trip. We're almost there! Leslie Y.
Julie, this is stunning. PCs have got to be incredibly hard to paint. Great job! As soon as you get that method worked out, how to light objects coherently in ways that are different from your reference photos, let me know. This will save me a lot of time. Because I don't have a clue. Boy you nailed the background colors too. And that pesky knowing-when-to-stop thing. Brava. 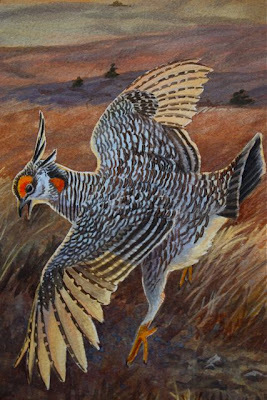 A fez would look real snappy on a prairie chicken, too.